If various commercial advertisements keep appearing on your screen, there is a possibility that an advertising-supported application, for instance, ShopDiscounts has slithered onto your computer. The program itself is based on JustPlugIt engine and acts very similarly as RocketCoupon, LuckyCoupon, SaverON, and other applications from the same family. It is not even surprising if you cannot remember downloading this software yourself because ShopDiscounts tends to enter the system without user’s permission. You should never trust programs that appear on your computer out of nowhere because in most cases they act in an undesirable way. The only way to stop them is to eliminate them from the system; thus, you should get rid of ShopDiscounts without further considerations as well. If you need some help, you should definitely use the instructions that we have made for you. As other advertising-supported applications, ShopDiscounts will not only show various commercial advertisements on your screen, but might also do other suspicious activities. As the recent study has shown, ShopDiscounts is interested in the information associated with your online behavior. As it seeks to lure computer users into clicking on ads, it is not surprising that it presents ads based on the user’s interests. We still do not recommend clicking on any of them because you might be taken to unreliable websites. You might not even notice when and how adware programs enter the system because they are very sneaky. As the research has shown, the majority of such applications (including ShopDiscounts) travel bundled with suspicious software. Thus, in order not to allow them slither onto your computer, you should download and install only completely reliable applications. Of course, it might be difficult to distinguish whether the program is reliable or not, which is why it would be very clever to install an antimalware tool on the system. Make sure that the security tool is reliable because those untrustworthy ones might show fabricated scan result and even allow other infections enter the system easily. It is necessary to eliminate all the suspicious applications from the system because they might act unacceptably. 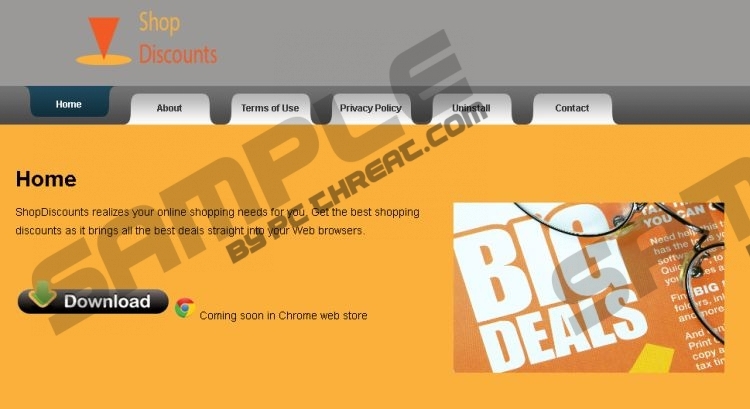 An automatic tool will help you to delete ShopDiscounts without any difficulties. Besides, it will delete all other threats residing on your PC and protect your computer from future infections. Of course, it is not forbidden to get rid of ShopDiscounts manually as well; however, you should keep in mind that you need to have some specific knowledge. Right-click anywhere on the screen and then and then select All apps. Quick & tested solution for ShopDiscounts removal.